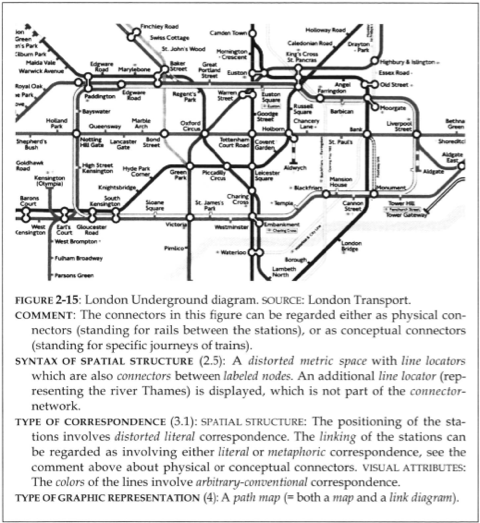 I read into Yuri Engelhardt’s dissertation “The Language of Graphics”, and I think it is a fantastic piece of work. 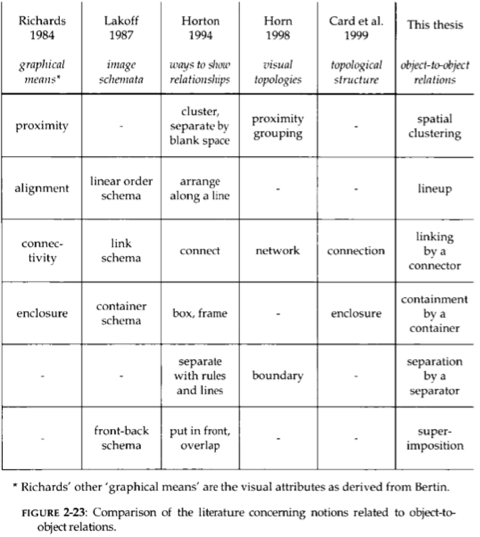 As the title suggests, the thesis suggests a linguistically motivated approach to the analysis of graphics: based from a syntactical analysis of space, objects and their relations, Engelhardt classifies and exemplifies different types of syntactic structures in which graphical objects can be arranged in order to convey meaning. A great achievement is the comparison and “translation” of numerous, discipline specific approaches in this area, ranging from Tufte, Bertin, Card, over MacEachren to even Lakoff. 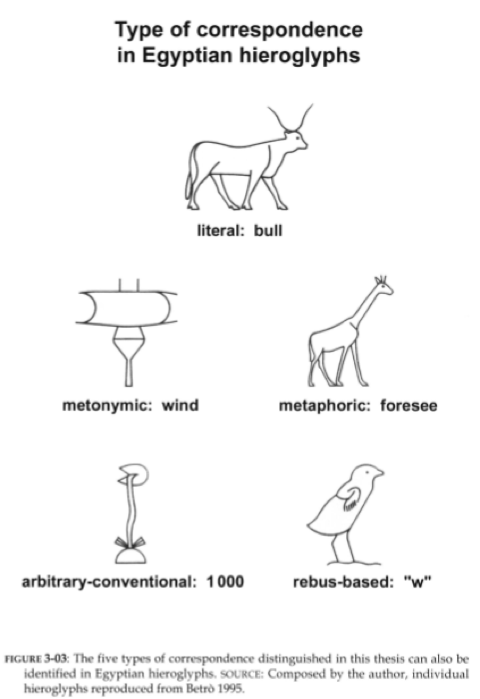 Besides, I especially enjoyed his discussion of syntactic roles: Analogously to the different syntactic roles verbs can have in a sentence, the same visual elements can trigger different semantics or have different degrees of freedom according to their syntatic role in a graphical representation. Good examples are map markers, labels, containers, separators etc. Again, this part is analytically really strong and I believe also quite novel in this form. The thesis closes with a discussion of interpretation and semantics, and a resulting classification of graphic representations. But I haven’t gotten this far yet. It is about graphic design. It is somewhat a summarization of material from the 7-volume Kodansha series on graphic design. Nice site you have going here – thanks! Thanks for another informative blog. Where else could I am getting that type of information written in such a perfect method? I have a undertaking that I’m just now running on, and I have been at the look out for such information.